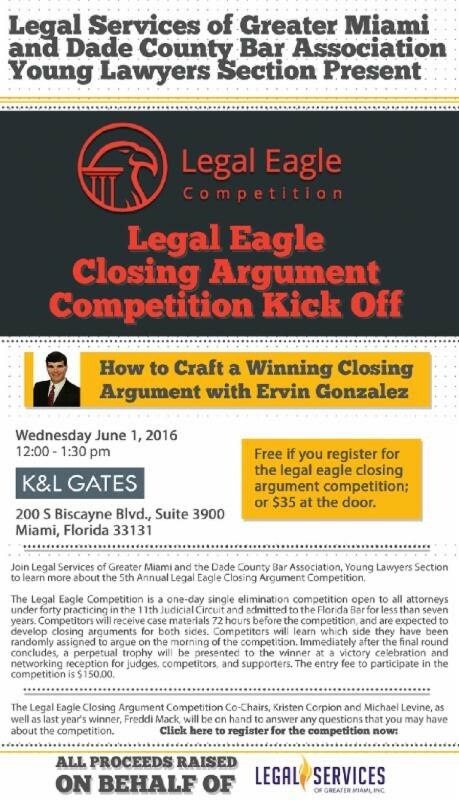 CORAL GABLES, Fla. (May 31, 2016) – Attorney Ervin A. Gonzalez, a board certified specialist in civil trial law and a partner at the Coral Gables-based law firm Colson Hicks Eidson, will provide tips on presenting a winning closing argument during the Legal Eagle Closing Argument Competition kick-off event on June 1, 2016 hosted by Legal Services of Greater Miami and the Dade County Bar Association, Young Lawyers Section. The luncheon will kick-off the Legal Eagle Closing Argument Competition, a single elimination competition hosted by FIU School of Law that is open to all attorneys under forty practicing in the 11th Judicial Circuit and admitted to the Florida Bar for less than seven years. Competitors will receive case materials 72-hours before the competition, and are expected to develop closing arguments for both sides. Competitors will learn which side they have been randomly assigned to argue on the morning of the competition. The one-day competition will take place on Saturday, June 11, 2016. The entry fee to participate is $150. Click here to learn more or to register for the competition. All proceeds raised will benefit the Legal Services of Greater Miami, Inc., the largest provider of broad-based civil legal services for the poor in Miami-Dade and Monroe Counties. The luncheon is being held from noon to 1:30 p.m. on June 1 at the office of K&L Gates (200 South Biscayne Blvd. Suite 3900). The competition’s planning committee – GenNext – will be on hand to speak with attendees. With more than 25 years of experience in civil and business litigation, Gonzalez has obtained 32 verdicts in excess of $1 million. Many of his verdicts have been rated among the top verdicts in Florida and nationwide. He has also settled numerous multi-million dollar cases, including a $100 million class action settlement. He specializes in products liability, class actions, business litigation, medical malpractice, and personal injury.